Just 30% of U.S. employees are engaged in their jobs, but top companies boast double that engagement. Here's what they're doing right. Top-performing companies start engaging employees from the minute they show up on the first day. Only 30% of American employees are engaged in their jobs -- a figure that hasn't moved much in more than a decade. Given the proven links between employee engagement and financial outcomes, this low level of engagement is a drag on an already sluggish U.S. economy. Imagine the positive -- even dramatic -- impact on the country's economic prospects if companies could double the number of their engaged employees. This is hardly a pipe dream. Gallup sees substantial increases in employee engagement all the time. Many of Gallup's clients, large and small, are already boosting their engagement levels or are well on their way. 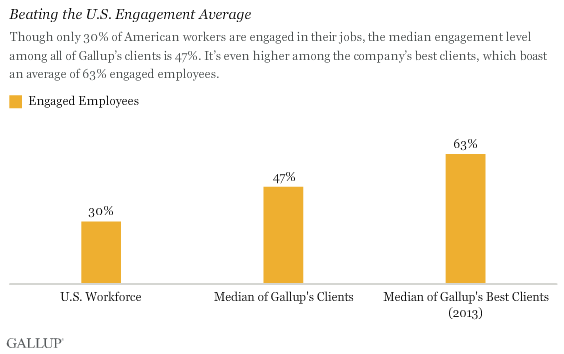 The median engagement level among all of Gallup's clients is 47%, and it's even higher among the company's best clients. These companies have an average of 63% of engaged employees and boast nine engaged employees for every actively disengaged employee -- a ratio that is more than five times the national average. Strategy and leadership philosophy. Although most companies recognize the central role employee engagement plays in driving profit and growth, leaders still fail to explain how engagement connects to the company's mission and growth strategy. If leaders portray employee engagement as simply a survey or human resources initiative -- or worse, aren't involved at all -- they won't realize the business results they're looking for. The best leaders understand that there's an emotional undercurrent to everything they do, which affects how they conduct business every day. They take a strategic top-down approach to engaging leadership teams and then make sure engagement cascades through the ranks of managers to employees on the front lines. Accountability and performance. Highly engaged companies hold managers accountable -- not just for their team's engagement, but also for how it relates to their team's overall performance. They embed engagement into managers' balanced scorecards and use it as a performance evaluation criterion. What's more, the most engaged companies Gallup works with infuse engagement into their culture through the tone their leadership sets and through the way employees and managers do their work. Engagement permeates every conversation, whether it's a one-on-one meeting, a team huddle, or a regional assessment. Communication and knowledge management. Leaders in the best companies take a strategic approach to aligning their employee engagement communication efforts. They find ways to communicate engagement's impact throughout the year and share engagement tools and best practices in the organization. Employee engagement is fully integrated into the organization's lexicon. Leaders use every opportunity, touchpoint, and communication channel to reinforce and recognize the organization's commitment to employee engagement. Development and ongoing learning opportunities. Top-performing companies start engaging employees from the minute they show up on the first day. These businesses have well-defined and comprehensive leader and manager development programs, but they go one step further -- they fully integrate employee engagement into these programs. They take leaders' and managers' development seriously and focus on the development of individuals and teams. Employee engagement is a fundamental consideration in their people strategy. Engagement doesn't happen by accident; it takes intentional execution, hard work, and perseverance to master the integration of each of these four critical components. Top-performing companies are focused on outcomes. They define and rigorously measure success at every level in the organization in a way that focuses every person, team, department, and business unit on driving performance and results. To be sure, transformation isn't easy. It requires a lot of energy and effort to initiate change and even more to build on that momentum. But it is possible. As Gallup's research shows, the benefits are tremendous for businesses that get it right. These businesses are more productive and profitable. They are more likely to retain top talent and attract new talent because their engaged culture differentiates them from other workplaces. They get the most from their employees by tapping into their passion, potential, and discretionary efforts. And they get the most from their customers when employees become brand ambassadors for the company and learn to maximize each customer interaction. These companies consistently outperform their competitors, and they consistently grow and thrive -- even in challenging economic times. Right now, if your business is like most, only about one-third of your employees are committed to your company's success. And that's clearly not enough to overcome the two-thirds of your workforce standing in their way. So, while doubling engagement may seem like an uphill climb, it's easier than justifying a company's downhill slide.